In the first part of this two-part post, I talked about the importance of getting good information about the gifted readers in your class and about providing a wide range of different types of texts for those students to read. But how else can you differentiate for gifted readers in a busy classroom? Note: While this blog post is aimed at teachers in Kindy/Prep/Reception, Grade 1 and Grade 2, many of the ideas are adaptable or applicable to older grades as well. Like background knowledge, vocabulary is something you develop with more time, more reading, more conversation, more exposure to different experiences and . . . well, more time. Asking 5, 6 or 7 year olds to automatically have the same vocabulary as older students is a tall ask. While many of these young gifted readers have wide and varied vocabularies, it’s very possible that they have gaps in their vocabulary knowledge or that they are missing vocabulary understanding when it comes to particular subjects. While they can continue to grow their vocabulary through reading, it’s important to provide opportunities for students to see vocabulary as something you can work on, something to strive to improve at. Parents of gifted readers will tell you that it’s incredibly frustrating to see sight words or high frequency words come home which are well below the level of their children. These are often accompanied with instructions to ‘learn them’ to ‘laminate the cards’ or to ‘check Pinterest for fun activities’. While these are excellent ideas for students who are learning these words, they leave parents of gifted readers wondering whether their child is being catered for at all, and what possible alternatives there are to sight word activities. Offering a vocabulary list instead of sight word list is an easy way to differentiate this kind of homework (or school work) for gifted students. Like sight words, you can offer a few easy activities - look up the word, write a sentence with the word, see if you can spot the word in a book, draw the word - for students to complete in the classroom or at home. You can find or suggest additional ideas through Pinterest or extend students with ideas like using folding resources. You can also help young gifted readers to extend their reading by teaching them how to look up word definitions in a dictionary. Students can develop the skills of finding words, looking at multiple definitions and (at times) looking up more words so they really understand the definition. This is a skill they’ll be able to use for years to come! How do you make it work in a busy classroom? You can create or find vocabulary templates (or teach students to draw up their own) so students can engage in vocabulary work at a range of times. To find vocabulary lists, search online for a few years above the grade level of your students (this is where testing will assist you in knowing what level your gifted readers require) - there’s a lot available! A number of subject lists are also available. To teach dictionary skills, see if you can work with a range of teachers across different grades to put together a small group of students who would benefit from learning these skills. If you have a teacher-librarian, they might be able to put on a little workshop for the students or you may be able to work with your Principal or Curriculum Leader to release a teacher to teach dictionary skills. This one is especially important when it comes to school libraries. Many, many young gifted readers have experienced the deflating experience of visiting the school library only to be told, ‘No, you can’t borrow that’. When questioned, various reasons are given for this refusal: the book is too hard (even if the student has borrowed harder books previously); they can’t comprehend it (even if they have other books in the series at home); the subject matter is too old for them (even if parents have given permission); it’s just school policy. If it’s school policy, then it’s bad policy - designed to dull a love of books and libraries (which should be enjoyed as the magical places they are). As a teacher, I recommend finding out whether your school has a policy like this and whether it should be updated to allow for the fact that some younger children read harder books - or that their parents are happy to read harder books to them. As for the other reasons, they usually stem from a lack of knowledge of the student (that’s where you - as the teacher who knows the student - can step in) or concern about parent reaction. One teacher librarian told me that her school solves that issue by asking parents for blanket permission, then recording that permission so students don’t have to ‘re-ask’ every year. Getting to know the books in the school library allows students to explore a really wonderful range of books in a place where they are regular visitors. If you don’t have a school librarian, or your school librarian is reluctant to recommend books suitable for your gifted readers, consider finding an older ‘reading buddy’ from a higher grade - someone who loves books and reading and will share some of the delights of the school library with your students. Keep an eye out for advanced readers - anyone who might be reading more than picture books - before you start library borrowing. A quick note home to parents can help you get parent permission. You can then note this on a note you attach to the library box or basket or a tag attached to the child’s library bag. This way, you know who has permission at a quick glance. A gifted reader with excellent decoding skills will not be served with lessons purely aimed at decoding. And while some phonics lessons are excellent for spelling, constant repetition is also unhelpful if the gifted reader is already understanding and applying those lessons. However, busy work - asking a gifted reader ‘just to read their book’ or to just do -more- of what other students are doing, isn’t respectful to the student either. They have a right to learn to the best of their potential - just like any other student in the class. When it comes to differentiating for the gifted reader, it’s important to know where they can continue to learn (it all comes back to the testing!). Do they need to learn comprehension skills which help them with texts on unfamiliar subjects? Do they need to extend vocabulary knowledge? Should they begin to explore responding to texts through reviews or reader reactions? Or could they learn more about sentence structure and grammar so they understand why a sentence works - or doesn’t work? Vocabulary and comprehension skills are two places where you can differentiate for students. If the class is concentrating on reading a particular book, you could ask gifted students to ‘insert’ or ‘substitute’ a range of provided words into the original text and to work out where they would be effective (a great way for students to apply their vocabulary understanding with words they have previously defined). You can also provide deeper thinking questions for students to reflect on while the class is reading particular books. Retelling stories in different ways, creating questions for stories or other texts and asking ‘what if . . .?’ questions are all ways that students can extend their thinking about stories. And sometimes differentiation can be as simple as using correct terminology as well as easier wording when talking about sentences - pointing out that descriptive words are also known as adjectives provides a framework for students as they explore sentences in more detail. This can be the hardest thing to make work in a busy classroom, but the more you do it, the easier it will become. Remember that differentiation doesn’t always need to be a whole new lesson - it’s ok to repeat activities like writing reviews (even adult book reviewers improve by repeating this! ), creating questions, finding effective words in texts or asking ‘what if . . . ‘ questions. And sometimes differentiation can happen just by offering an alternate text. 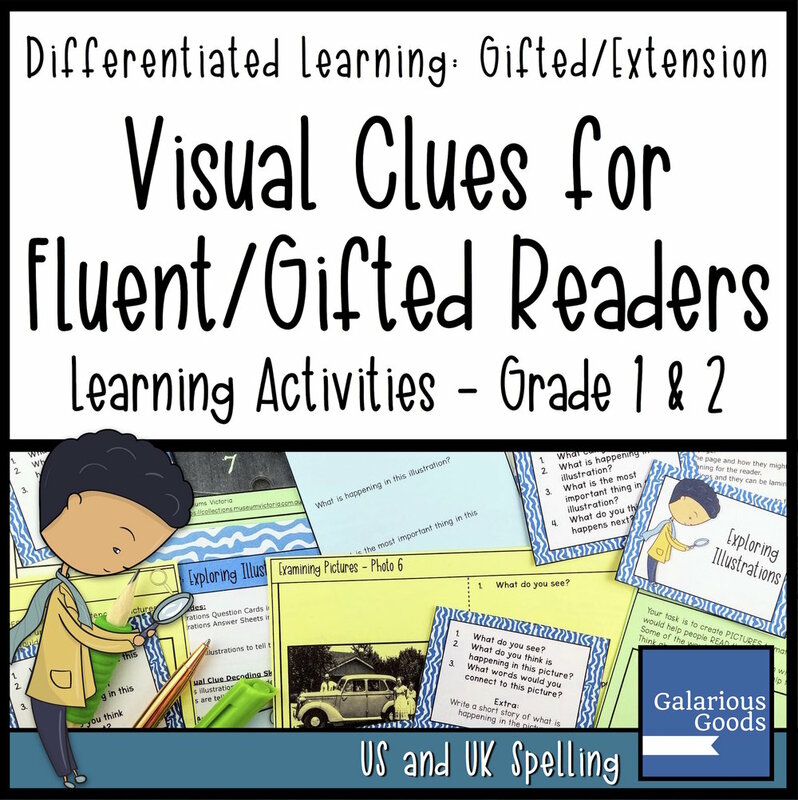 When you’re planning, ask yourself if there are any skills your gifted readers will need to explicitly learn - whether it’s how to write a review, use a dictionary or what a verb is. You may be able to work with teachers of other gifted readers to make this one group during literacy rotations, or you may be able to work with one or two gifted readers during silent reading time or individual learning time. And remember, even if your gifted readers are working on self-directed work - make time to check on their understanding and to show them that their reading is valued in your classroom. Have you read Part One of this post? It covers testing and offering a range of texts and is a must read! 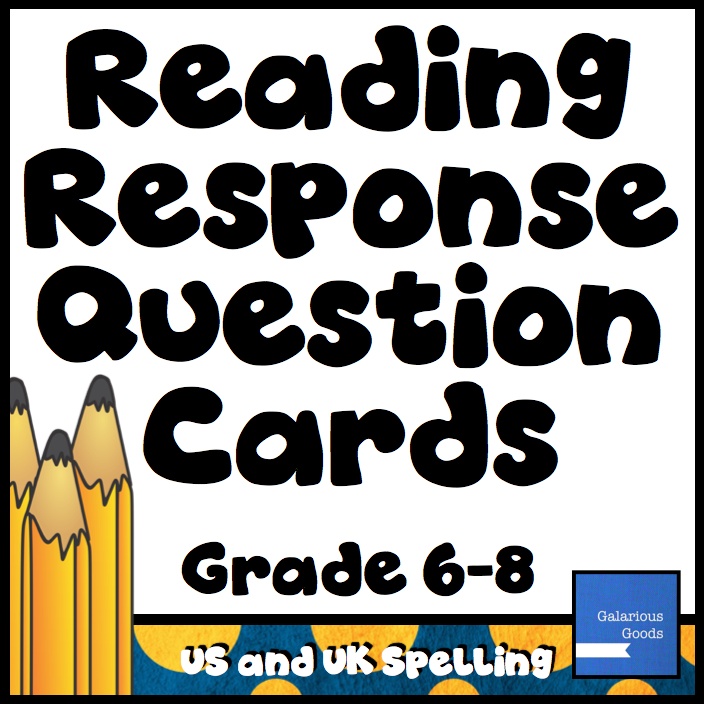 Looking to differentiate reading instruction in your Year 1 or 2 classroom? 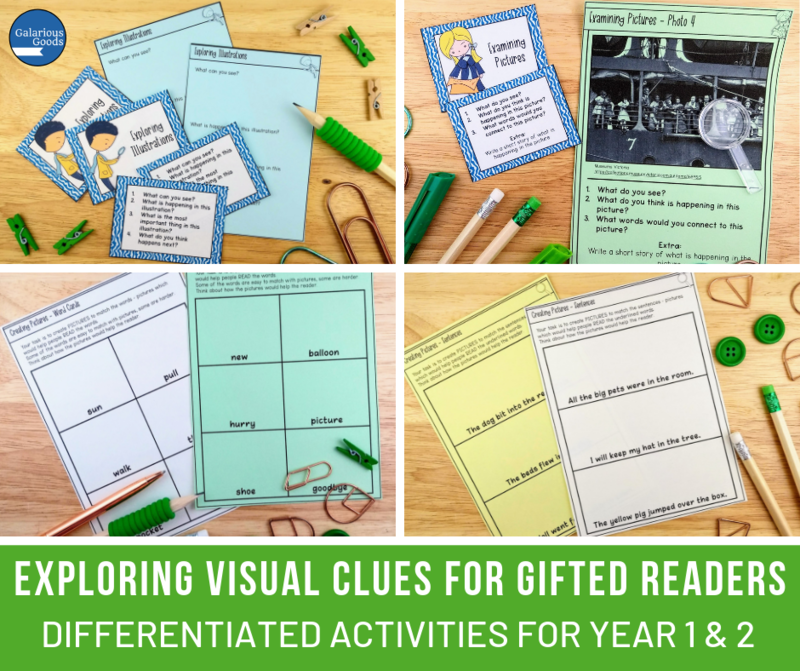 You can now get the Visual Clues for Gifted Readers resource. This resource can be used alongside teaching visual clue decoding (look at the picture or ‘Eagle Eye’) or individually to encourage visual comprehension. This resource has 4 activities - two which ask students to ‘read’ images or illustrations and two which ask students to create images to work with words or sentences - as well as further learning ideas in the extensive teaching notes and sample responses. You can also follow Galarious Goods at TeachersPayTeachers to be informed when more Gifted Learning Resources are available. You get a list of the reading levels of your incoming class and there it is - a student on Level 26, way above the average level of the rest of the class. Or, you notice that there’s a student who’s reading all the posters in your classroom - including the evacuation procedures - while the other students are working on their early letters. Or, you have a student who is asking to borrow novels from the school library - even though students in his grade are only supposed to borrow picture books. It’s not tremendously unusual to come across students who can read before they start school, or who pick up reading very quickly when they do start. But there isn’t an awful lot of support for those students - or their teachers. How can you plan for those gifted readers and differentiate to meet their needs in your classroom? It can be tempting to leave gifted readers for a while before testing their reading. After all, testing reading takes time - serious time. And you already know that those students can read. Testing is essential, however. Without it, those students have no benchmark, nowhere to grow from. It makes it harder to plan for those students effectively, and it makes it harder to show parents or admin how you’re differentiating for those students when you have no idea where they really are. As well as testing them using standard tests, consider offering them a couple of other texts to read - and to answer comprehension questions on. Texts on unfamiliar subjects with lots of context clues (like pictures) can be a great way to see if students are using strategies to make connections. Upper level informational readers are great for this. Also consider asking your student to read and answer some thoughtful questions on a familiar text like a picture book. The student may be better on comprehension when they have the background knowledge to infer and make connections - and a lot of the harder standard tests are aimed at older students with more knowledge behind them. If you’re struggling to find time to test reading, check with support staff to see if there’s anyway someone can give you a hand with your class while you test. See if you can work with another class where one teacher tests while the other undertakes some easy activities with the students. Plan some independent activities which allow you enough time for testing - and talk about how important it is for students to give you the time and space to get good information. Do you have a reading area in your classroom? Think about what you have in it. If you primarily have fiction picture books, you’re probably not meeting the reading needs of your gifted readers. Sure, they can read them - picture books are wonderful for all sorts of learning - but there’s no challenge to read further, to build more background knowledge - and there’s a subtle message that the reading area may not be for them. Often young gifted readers are told that they aren’t good with comprehension. However, the problem is often that they’re too young to have built the kind of background knowledge you need for effective comprehension. That comes with age and with exposure to a wide range of books (and other experiences). It’s unreasonable to expect a full classroom library of novels for one or two students, but there’s no reason you can’t include non-fiction books or poetry books or magazines aimed at younger readers. These texts can all be looked at and enjoyed by all the students in the class, but they give your gifted reader the option of more types of texts and different styles of writing - as well as helping them to build that background knowledge which helps so much in comprehension. What if you have a student who is capable of reading a range of texts, but will only stick with the familiar? This is where you can think about your different subject areas and what you’re teaching there. If you’re looking at how materials change in science, have some reading texts about materials or change available. You can ask the gifted readers to explore these texts as part of their science lesson and report their findings back to the class, use it as a text during reading time and ask students to find connections or simply have it available for free reading. There’s great books available which cover all kinds of subjects these days - perfect for extending subject areas into text. Do you book talk the books in your classroom? Talk about them, introduce them, or ‘sell’ them to your students? Try book talking you non-fiction or poetry books as well as picture books. It’s a quick and easy way of making a range of texts appealing to your students - and challenging your gifted readers to try something new.